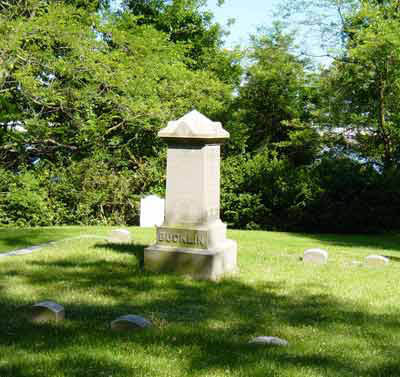 There are a large number of Bucklins buried in Rhode Island cemeteries. 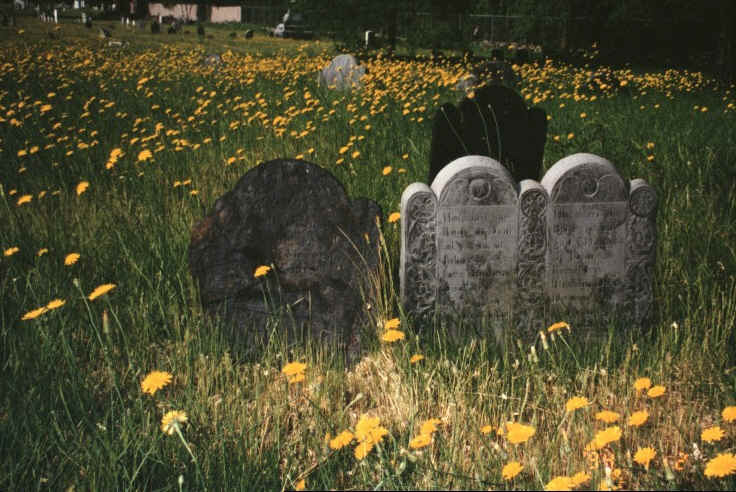 The Rhode Island Historical Cemeteries Transcription Project will allow you to find them. 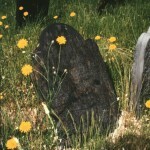 There will be about 500,000 headstones recorded when the project is finished. If you want to access the whole data base visit the Rhode Island Historical Society in Providence, Rhode Island. 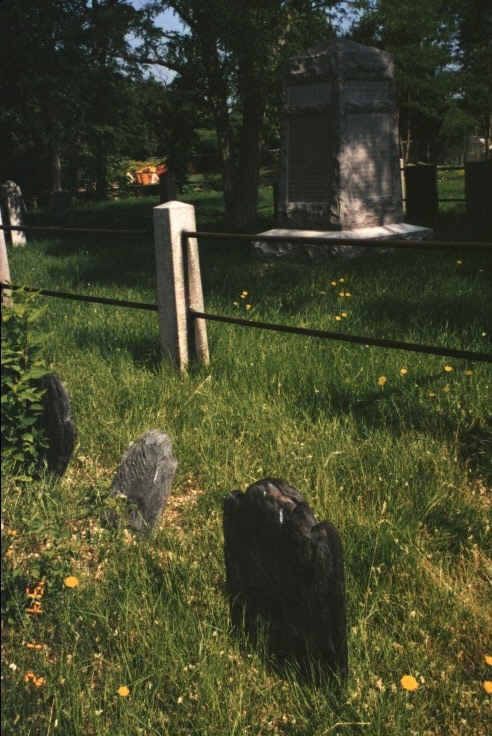 The historic Newman Church Cemetery has a fine area, with a large central marker, and railing, enclosing several Bucklin graves. Several Bucklin graves of the 1700’s are nearby, but outside this railed area. Other Bucklin graves from the 1700’s are scattered elsewhere in the cemetery. Bucklin family grave area in Newman Church cemetery in Pawtucket, RI. 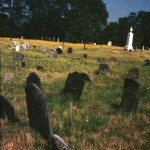 This is the cemetery where many of the early Bucklins are buried. 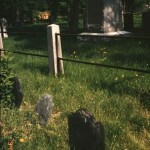 The large central shaft and fenced off area (in the background of the first photo) is an easily identified landmark in the cemetery. 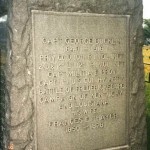 The American flag marks the grave of John Bucklin 1732-1790. The Newman Church as three cemeteries associate with it. The cemetery south from the church, across Newman Avenue, is the Newman Cemetery. It’s sole entrance is from Newman Ave. 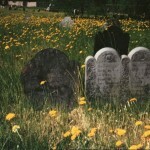 Originally, the Newman cemetery was privately owned by the Newman family. Immediately adjacent on the south of the Newman Cemetery is the Hunt cemetery. It is small. You may not be able to see any real physical distinction of it from the Newman Cemetery. 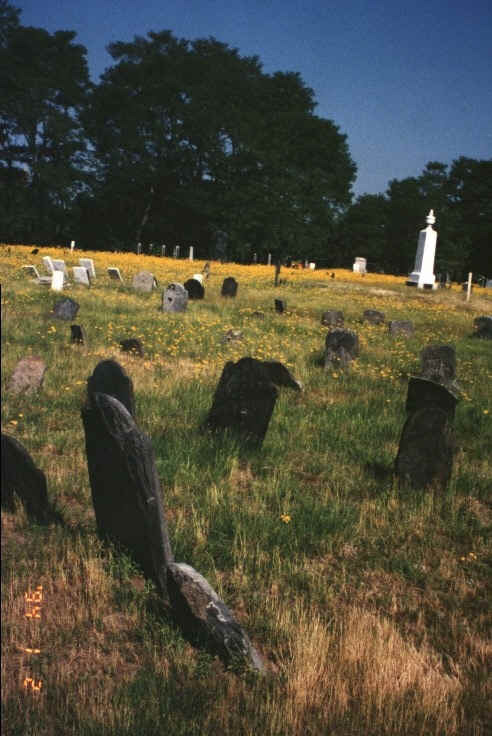 The Hunt cemetery is small, but has three entrances from Pawtucket Ave.
To the north of the Newman Church is the Lakeside Cemetery, the largest of the three cemeteries. You can see how the tipped character of David’s stone exposes it to the ravages of time. It is important to read and record these stones before they are totally unreadable. 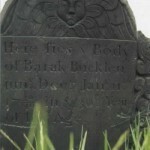 Barak Bucklin d. 11 Jan 1739/1740. He died less than 1 year after the Barak Bucklin whose grave is nearby.. His stone is leaning over, and thus the face has been saved from the ravages of the elements. His stone is across the small road from his father’s stone. 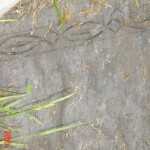 When you click on this thumbnail to enlarge it, you will be able to read this stone. 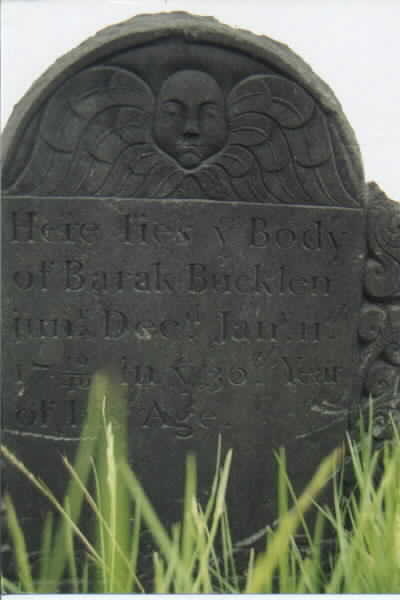 Barak Bucklin d. 7 Feb 1738/1739. 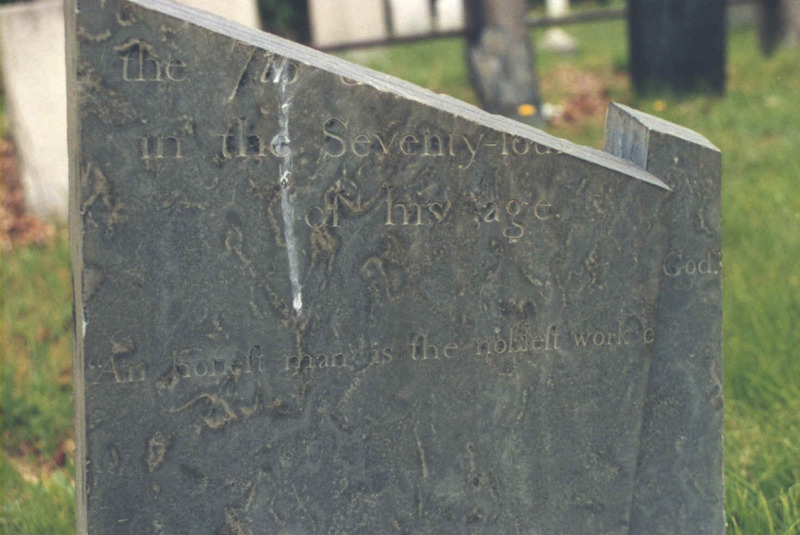 This stone is almost unreadable, and we would appreciate anyone sending us a transcription of the stone. 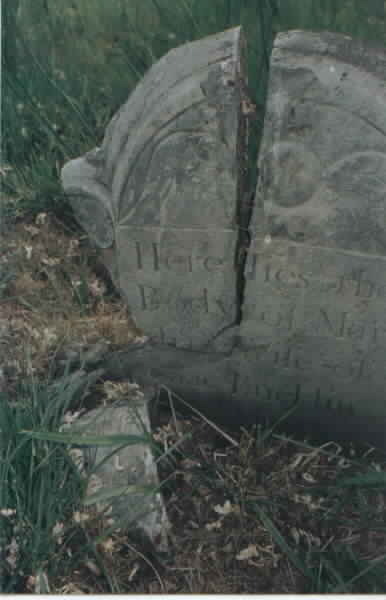 Another view of the grave of Barak d. Feb 7, 1738/39. 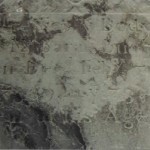 It is the tipped stone in the center of the bottom of this photo to the right of this text. Civil War historians in the Family may like to see graves such as this marker for Capt. George (Battle of Fredricksburg) in the main Bucklin area in the Newman Church cemetery. You can read his military history by clicking on the thumbnail and enlarging it. 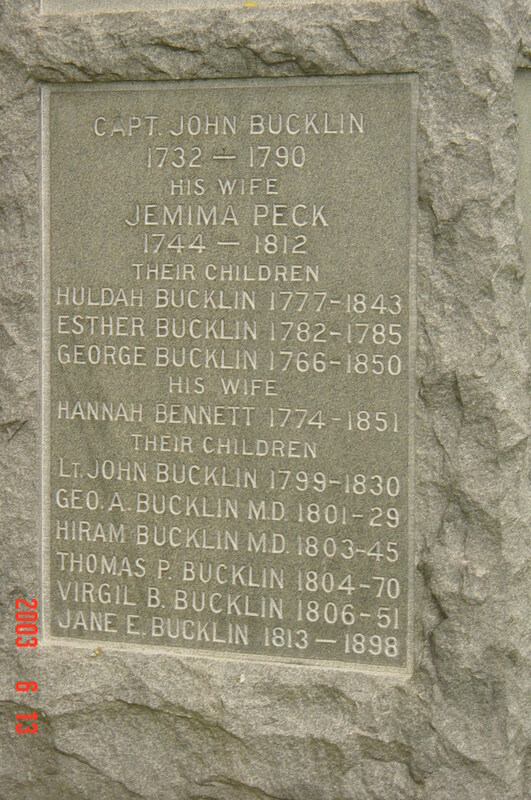 John Bucklin 1732-1790 and his family are recorded on this side of the main Bucklin area’s column. Click on this thumbnail and read the interesting genealogy of this family. John was a captain of the Rehoboth Minute Company in 1774. This was the forerunner of the Revolutionary Town Militia. Originally chartered in 1774 by the town of Rehoboth as a town Militia unit, the unit was comprised of mixed Militia and Minutemen. The “Minute Men” were men specially charged with being ready to march on “a minute’s notice” for the defense of the town. By 1775 the Rehoboth Militia was a force of 210 persons. At that time there were under the command of Capt. John Daggett of Attleboro and Col. Timothy Walker of Rehoboth. On April 9, 1975, ten days before the confrontation between the British and American forces at Concord and Lexington, the unit was sent to Freetown MA. Without a shot being fired, the Rehoboth militia seized 40 stands of British arms, munitions, and accoutrements. We assume that Capt John Bucklin was among those persons. Is it little wonder that the English army commander was marching to Concord and Lexington to seize the powder and arms of the Massachusetts Militia and Minutemen in those towns! The Rehoboth Minutemen and Militia was an active defense system for the town until April 24, 1840, at which time it was disbanded by General Order. The descendants of Capt. John Bucklin included may important figures of the next century, like Thomas Peck Bucklin, (the Thomas P. Bucklin in the plaque shown above) one of the richest of the persons owning companies of clipper ships. We believe that whoever erected this plaque for some reason did not include all of the children of Capt. John Bucklin, instead opting for including the children of George and Hannah. The central stone column has four equal size bronze plaques on it, commemorating different persons, so considerations of plaque size may be one reason for the option chosen. We certainly hope that members of the Society will spend some time taking photos of the existing Bucklin graves, before they disappear. For example, here is a gravestone of a Mehitabel who was a wife of an Isaac Bucklin. We still have not identified her, or to which of the many Isaac Bucklins she was married. Notice how in June of 2001 the stone was falling apart. It will not be long before the pieces will be gone! 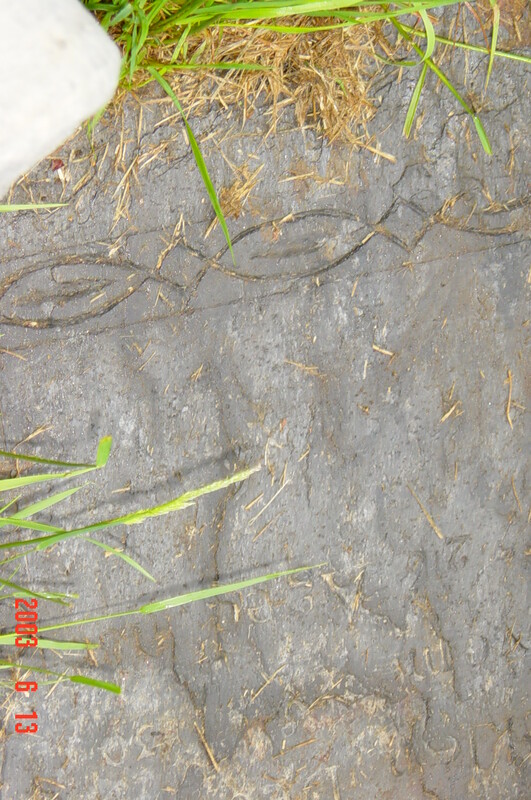 And here is a gravestone of a “Mary, wife of Isaac Bucklin” that has fallen over years ago. It lays flat on the ground, and we saw only a corner sticking out of the ground, near but outside the Bucklin railed area. By scraping back the dirt with our hands we saw what we could photograph. Probably in a year or so the dirt will recover it. The only Mary we know of in the appropriate time frame married to an Isaac is Mary Marsh, who died 06 Mar 1727/28 in Rehoboth, as the wife of an Isaac Bucklin who did not die until 1758. 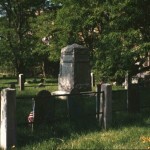 Capt Daniel’s grave is in the North Burial Ground of Providence. 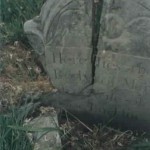 In June 2000, the headstone was found with the top now completely broken off. The only part still readable is “…seventy fourth …. of his age. An Honest Man is the Noblest Work of God”. 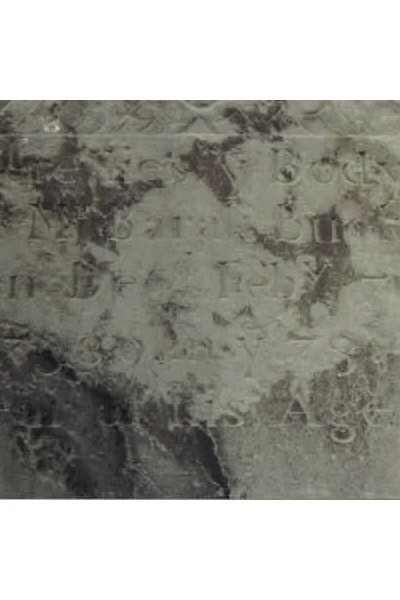 Fortunately earlier transcribers recorded that this stone showed his name as Capt. 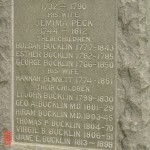 Daniel Bucklin born in Rehoboth and died May 7th 1805. Daniel’s title of Captain comes from his sea voyages, one of which is described as follows. 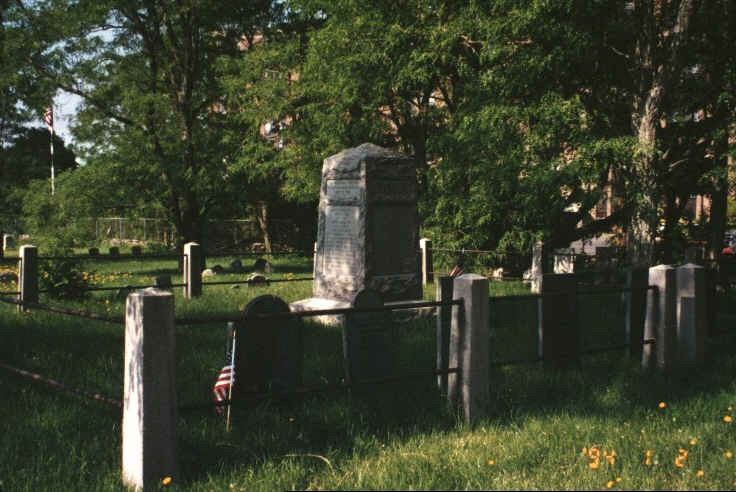 The historic North Burial Ground of Providence Rhode Island has graves of several of the Gaspee Raiders. The Old North Burial Ground (ONBG) is difficult to find anything in, and the indexes the overworked staff have to work with are not good. The fact is that from 1700 to 1848 the only official record of where in this huge (and largely now unkempt and overgrown cemetery) persons were buried is the testimony of the gravestones themselves. Important: to find the grave of someone, start by reading the tips we have on finding a grave in the ONBG. Those tips, titled as “Research at the Old North Burial Ground on Providence, RI”, By Leonard Bucklin, Esq. & Corinne H. Smith, are placed on the Gaspee Archives website as part of our project to identify all the Gaspee Raiders. 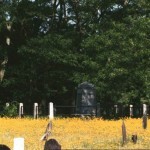 A list of these graves in that 22 acres shows many families associated with the Gaspee affair. 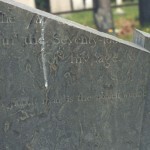 The following family names appear on at least 10 gravestones, bold type indicating 20 or more individuals. (Note Bucklin is one of those with more than 20 individuals.) Italic names are family names of possible Gaspee Raiders or conspirators. These are family names on which the Joseph Bucklin Society is concentrating research activity, as funds permit. Adams, Aldrich, Allen, Amsbury, Andrews, Angell, Annis, Anthony, Antram, Aplin, Arnold, Atkinson, Bacon, Bailey, Baker, Balch, Ballou, Barker, Barnes, Barney, Bartlett, Batcheller, Bates, Beckwith, Bennett, Benson, Bezeley, Bicknall, Blanding, Bliven, Bogman, Bosworth, Bowen, Bradford, Bragg, Bridgham, Briggs, Britton, Brown, Brownell, Bucklin, Budlong, Bullock, Burgess, Burlingame, Burr, Burroughs, Burt, Butts, Cady, Calder, Campbell, Capron, Capwell, Carpenter, Carr, Chace/Chase, Chafee/Chaffee, Chandler, Chappell, Child, Church, Clapp, Clarke, Clemence, Cleveland, Clifford, Coggeshall, Cogswell, Cole, Comstock, Congdon, Cooke, Cozzens, Crandall, Crawford, Cross, Crowley, Currie/Curry, Curtis, Cushman, Dailey, Daniels, Davis, Dean, Deming, Dexter, Dodge, Dorrance, Dunham, Dunwell, Dyer, Earl/Earle, Easton, Eaton, Eddy, Ely, Emerson, Fairbanks, Fenner, Field, Fish, Fisher, Fiske/Fisk, Foster, Francis, Freeman, Frost, Fuller, Gallup, Gallup, Gano, Gardner, Gartside, Gerald/Jerauld, Gibbs, Gibson, Gilbert, Giles, Gladding, Glover, Goddard, Godfrey, Gorham, Gould, Grafton, Grant, Gray, Green/Greene, Griffin, Grimwood, Guild, Hall, Hammond, Handy, Harding, Harris, Hathaway, Hawkins, Hayward, Hazard/Haszard, Healy, Hedly, Helm, Henley, Henry, Hereshoff, Hill, Holbrook, Holden, Holmes, Holroyd, Hopkins, Horton, Howard, Howell, Howland, Hull, Humphrey, Hunt, Ingalls, Irons, Ives, Jackson, Jenckes/Jencks/Jenks, Johnson, Jones, Joslin, Keith, Kendall, Kenyon, Kingsley, Kinnicutt, Knowles, Lassell, Leveck, Lewis, Lindol, Lippitt, Lonsdale, Lothrop, Low, Luther, Lyon, Maker, Mann, Manchester, Manton, Marshall, Martin, Mason, Mathewson/ Matteson, Mccall, Millard, Miller, Miner, Mitchaem, Mitchell, Monroe/Munroe, Moore, Morris, Mowry, Mumford, Najac, Newell, Nichols, Northup, Olney, Ormsbee, Osborn, Owen, Packard, Page, Paine/Payne, Palmer, Parker, Patten, Paul, Pearce/Peirce/Perce/Pierce, Peck, Peckham, Perry, Peter, Pettis, Phillips, Pidge, Pike, Pitman, Place, Poole, Potter, Power, Pratt, Proctor, Pullen, Randall, Rea, Read/Reed, Remington, Retto, Reynolds, Rhodes, Rice, Richmond, Ripley, Robinson, Rogers, Ross, Round/Rounds, Russell, Sabin, Salisbury, Scott, Seamans/Simmons, Selden, Sessions, Shalling, Shaw, Sheldon, Sherman, Silloway, Sisson, Smith, Snow, Sprague, Staples, Steere, Stevens, Stewart, Stillwell, Stiness, Stone, Studley, Sweet, Sweeting, Taft, Talbot, Taylor, Temple, Thayer, Thomas, Thompson, Thornton, Thorp, Thurber, Thurston, Tiffany, Tillinghast, Totten, Townsend, Tripp, Tyler, Underwood, Vaughn, Veazie, Vinton, Walker, Wall, Walling, Warner, Waterman, Watson, Weaver, Weeden, Wells, West, Westcott, Wheaton, Whelden, Whipple, Whitaker, White, Whitman/Wightman, Whitford, Wilbour/Wilbur, Wilcox, Wilkinson, Williams, Wilson, Winslow, Winsor, Wood, Work, Wright, Yeomans, Yerrington, Young. North Burial Ground, Providence, Rhode Island Old Section 1700-1848, by John E. Sterling is an attempt to create a record of what the headstones contain and the place of burials for the old section of the North Burial Ground of Providence. Why should such an effort be necessary? 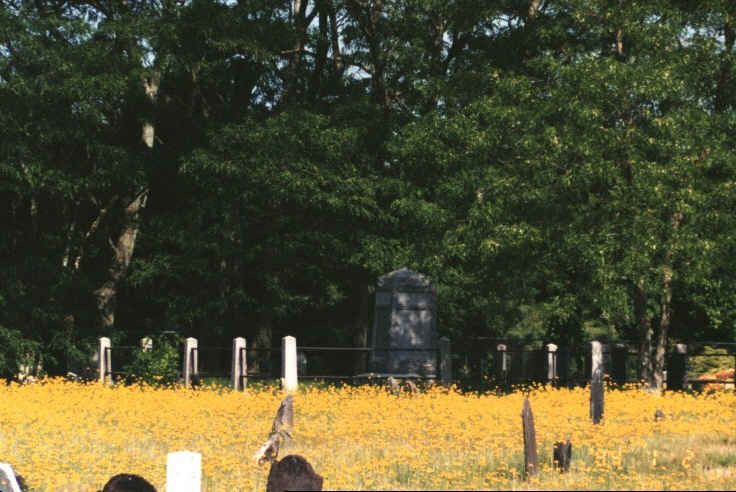 Although the cemetery maintains handwritten ledger books of interment records of information on some 73,000 individuals, these books document burials only for the last 150 years. By 1848 when records of burial locations began, the unrecorded burial locations filled 22 acres of the cemetery (roughly, the 22 acres are bounded by the present avenues of Main Avenue (east), Prospect Avenue (north), Front Avenue (south) and a line that ran just west of Central Avenue (west). 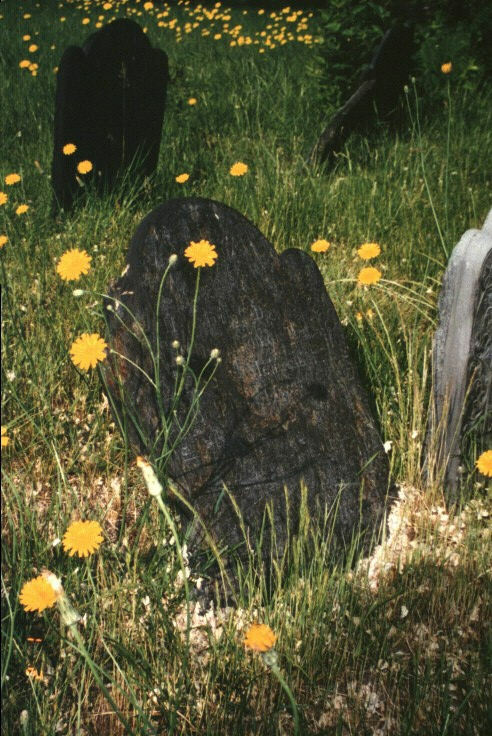 Sterling’s well illustrated book represents six years of patient research by John Sterling, one of the most respected figures in gravestone studies research in Rhode Island. An extended introduction traces the history of this venerable cemetery. With this book researchers have access to the vital information on each gravestone — and a key to its location — and those interested in finding a particular stone (virtually impossible before) have a guide. 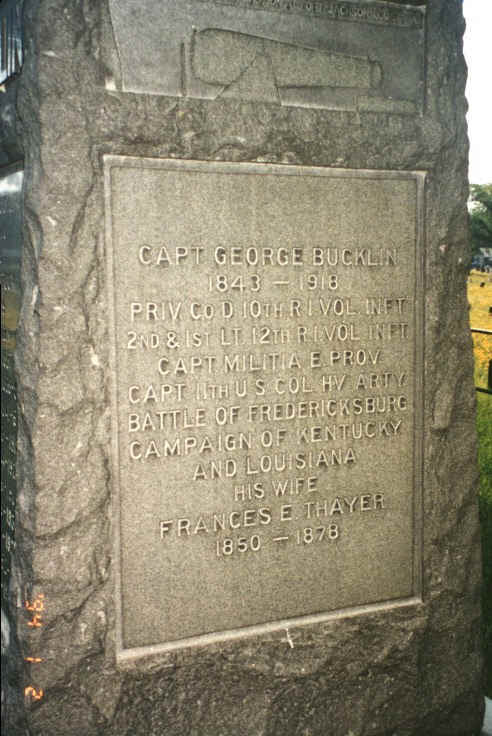 A number of Bucklins are buried in the Swan Point Cemetery of Providence. This lovely cemetery, considered to be one of the most beautiful garden cemeteries in the United States, has a point (Swan Point) jutting into the Seekonk River (Swan Point) that allows you a view of the Bucklin ancestral lands across the river. A computer in the office will allow you to type in the name of a deceased and then the computer will print a nice map for you to show you the burial location. Those of you with Bucklins in your ancestral line who were buried at Swan Point should spend some time in this beautiful cemetery. Look at the Swan Point web site. Take I-95 North to I-195 East. turn right into Gano Street, and go north to Waterman Street. left onto Butler Ave. Butler Ave turns into Blackstone Blvd. Swan Point Cemetery is 1.7 miles and on East side (right) of road.